I’ve had interesting reactions when I tell people I’m writing about the experience of grieving the death of a friend. I insist they’re – mostly – wrong, and truly, I believe it. But there are times when you want to rush the grieving process along, when it wears on you, when it seems as though it will never end. I’ve found the same thing goes for reading and writing about it. You think it won’t affect you. But it does. One of the hardest – though not the hardest – topic I’ve written about here and in my book is 9/11. It’s not because I knew someone who died that day; I was mistaken in thinking that would be the case. It’s a difficult topic for most people to think or talk about: the enormity, the shock, the ongoing ramifications. My second research trip to New York was for the 9th anniversary of 9/11. I went to various observances, including the Naming Ceremony. I visited the 9/11 Visitors Center, as well as the NYPD and FDNY museums. I read two books on that trip, written by survivors. I figured it would be emotional, so I built in a day to do nothing 9/11-related. I spent a good part of that rainy, raw Sunday at the Cloisters. I knew before I walked into Ft. Tryon Park that I desperately needed its serenity. The panic attack that started as I approached the entrance gradually subsided, until I left the grounds hours later, calmer and almost relaxed. But it wasn’t enough. The following evening I went out for drinks with a dear friend, a sweet, gentle man. I found myself trying to pick a fight with him – for absolutely no reason. The fact that he was also stressed (about other things) didn’t help. I had no reason to be angry with him – in fact, I wasn’t angry with him. But I realized when I got back to my hotel that the affects of all the 9/11 research had gotten to me. In fact, I could still feel them physically a week later. The following year, I was back again. This time, lesson learned. I spread things out over a longer period of time. I said no to attending some observances. I gave myself plenty of downtime. I collected the newspapers, with commemorative sections, but put them away to read later. I watched virtually no television coverage. I struck up more conversations with strangers – cops from Toronto and England, bartenders, waitresses. I partied late at Fashion Night with a woman I’d grown up with. And I took one complete day off – the 12th – to decompress after 4 straight days of activities. On the 13th, the second day it was open, the friend I’d picked on the year before accompanied me to the new 9/11 Memorial. I went to all the other observances alone, but for this one I knew I needed a friend. It was emotional for both of us to visit it – me, for seeing my classmate’s name, him, for having lived through the attack. The tears were a relief. We went out for drinks afterwards. We sat with our same vodkas at the same table at the same bar we’d visited a year before. This time the conversation was not the same. This time we were relaxed. We talked about our kids and getting older, we talked about baseball and theatre. We laughed. We hugged. The airplane analogy worked: if the cabin loses pressure, you’re instructed to put your own oxygen mask on first before you try to help anyone else. That’s a very tough thing to remember if you’re grieving or just writing about grieving. It’s next to impossible if you’re a caregiver. But it’s worth remembering today: you can’t help anyone else if you don’t take care of yourself. 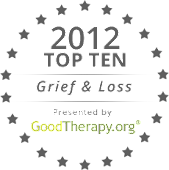 Wherever you are in the grieving process, take a moment today to step back. Turn off the computer or the TV. Turn off the lights and sit in darkness. Breathe. Find a way to recharge your batteries. Remember something incredibly stupid you did with your friend. Let yourself laugh, even if you wind up crying. Viki, like any third party to the grieving process, you can't help but get emotionally invested. Two ideas from your post caught me - powerfully: the airplane analogy was fantastic, and the basic reminder (that we seem to easily forget) - to simply breathe. It is interesting to watch you explore the texture and depth of the subject. Well done. Thanks, Karl! The past couple weeks of writing (since WDC12) have been really draining. I was forced to step back last week because my body was finally objecting loud enough that I heard it. I guess I'm still learning those lessons myself! Viki, This is such an important reminder of how we need to take care of our own needs before we even attempt to take care of others. The airplane analogy is perfect. Thanks for sharing your lessons learned so openly. You give us your best when you show your humanness- we can relate 'cause we're human too. :-) Excellent post! Thanks, Kathy! I was really naive about this until that one trip to NYC. I thought I was detached, an observer, and these things wouldn't have an effect. My bad. I just have to keep reminding myself!